Research led by Michael Lamb, professor of geology at California Institute of Technology, shows that debris flows and mudslides in the San Gabriel Mountains bordering Los Angeles County are the result of soil that has been stripped from steep hillsides during fire. 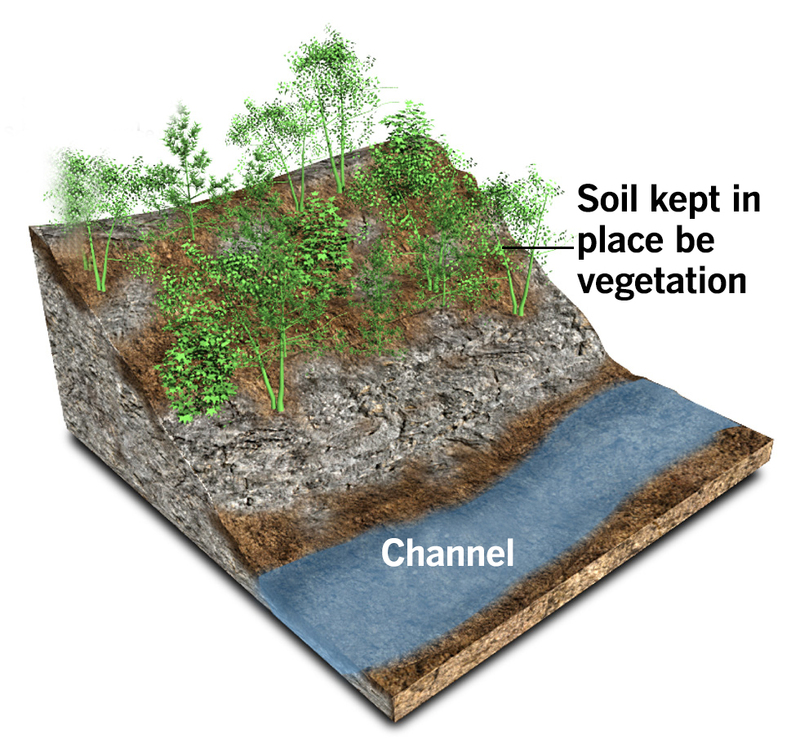 The stripped soil accumulates in river channels until a storm initiates a debris flow. Soil is trapped on steep rocky hills by vegetation. During summer’s fire season, vegetation is burned, causing sediment to roll down steep hills. 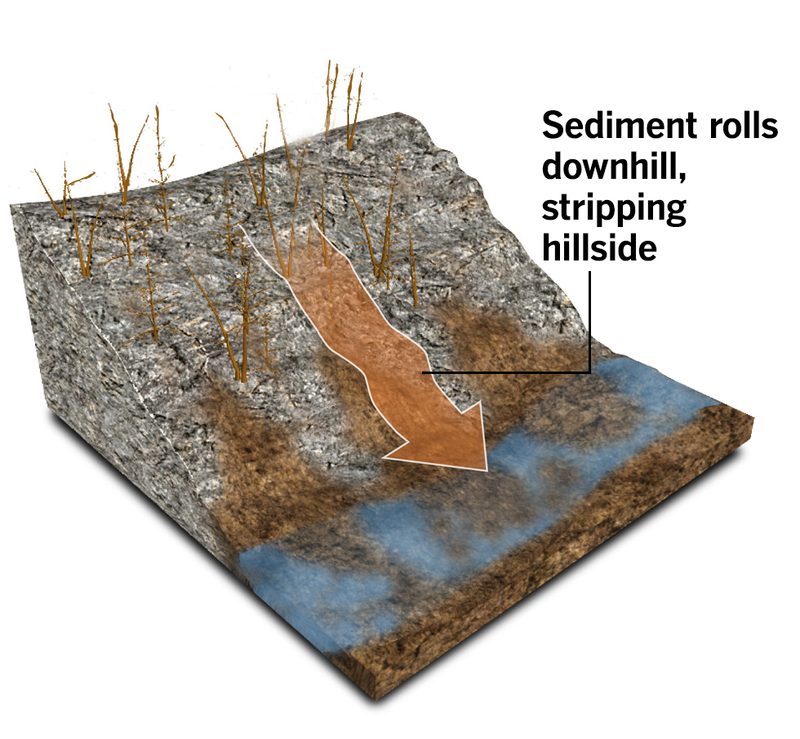 Within a few hours or days, channel bottoms are loaded with loose sediment. 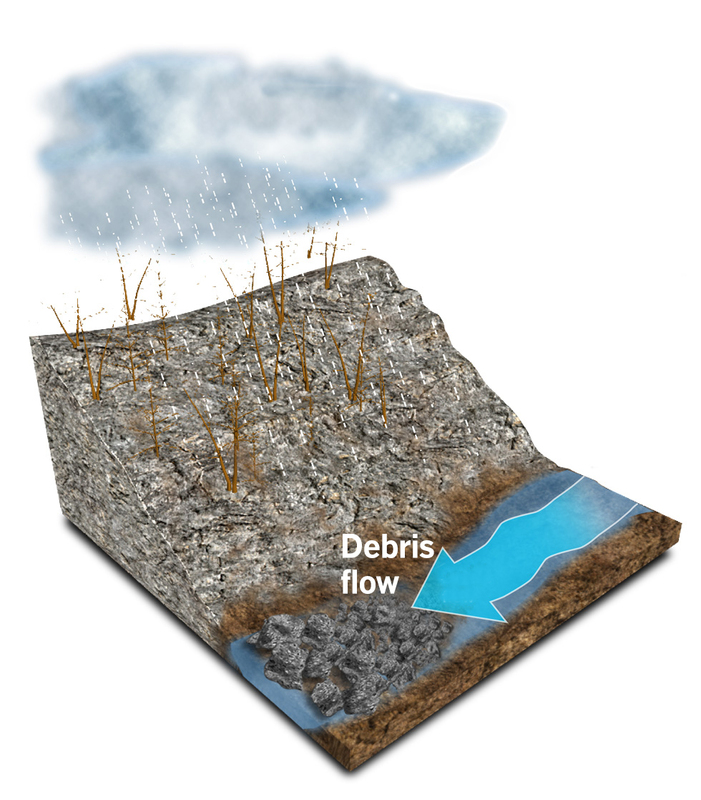 During a winter's rain, the water and runoff move sediment in the steep channels, producing debris flows. How long does it take for the hillside to recover after a fire? Although vegetation grows back in approximately five years after a fire, researchers estimate that it takes up to two decades for a hillside's soil to be restored to pre-fire conditions. Shown below are fire perimeters from 2009 to 2014 and areas of the San Gabriel Mountains steeper than 37 degrees, the slope beyond which dry soil is unstable without vegetation. Sources: Michael P. Lamb, professor of geology, Caltech; National Science Foundation and the Terrestrial Hazard Observation and Reporting Center at Caltech; topographic image of San Gabriel Mountains courtesy of Roman DiBiase, assistant professor, GeoMAC, Department of Geosciences, Penn State University.